Dialight plc has selected Flomerics’ EFD.Pro engineering fluid dynamics software, embedded in Pro/ENGINEER Wildfire, for the design of advanced lighting systems based on light-emitting diode (LED) technology. “Although power LEDs are becoming more efficient, a significant amount of input power translates into heat,” said Gordon Routledge, VP of illumination products, Dialight plc. 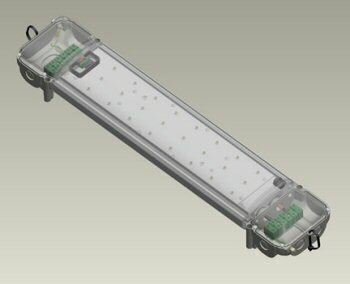 Dialight plc is a world leader in applied LED technology, operating in two principal segments: Components, where low brightness LEDs are used for status indication in electronic equipment, and Signals/Illumination, utilizing the latest high brightness LED technology for traffic and rail signals, obstruction lighting, hazardous location lighting and developing applications in more general illumination markets. Flomerics is a world-leading developer of engineering simulation software and services for analysis of fluid flow and heat transfer. Flomerics' business model, called “Design-Class Analysis” is drastically different from traditional analysis because its software is designed to be embedded deeply into the design process for use by mainstream design engineers, not just by analysis specialists. Dialight is the recognized industry leader in applying LED technology to the entire spectrum of visual applications. In business since 1938, Dialight has been pioneering some of the most innovative applications in LED technology since the early 1970s. Dialight plc selects EFD.Pro, Pro/ENGINEER Wildfire-embedded CFD, for the design of leading edge light-emitting diode (LED) lighting technology.